seemed like someone always had a project spread out on the kitchen table. it always makes us smile. NEW STOCKING COMING THIS MONTH! When I was in college, I got a job at a knitting store. After Teri graduated from high school, she came to work there when I went to Germany to school for a year. A year or two later while we were both finishing college and still working at the knit shop, the owner brought back a huge box of Aida cloth and a few patterns from Ginnie Thompson and Leisure Arts. She said that this was the newest thing at the market and could we figure out what to do with it. She never had any interest in it, but we took to it with a passion. Teri stitched her first piece on 11 count Aida--with brown floss--of a farmer and his wife for my sister’s in-laws, and for some mysterious reason the wife ended up at least 30 stitches taller than her husband. I was surprised, but she was undaunted, framed it up, and gave it to them for Christmas. It hung on their wall for years. Oh well, it could only go up from there. We then began to design patterns to go with the patterned pillow fabrics in the knit shop and I began to do freelance designing for a friend of ours who had begun Vanessa Ann Designs. completely renovated the space and embarked on the adventure of a lifetime. go back the next year--and have never stopped. fabrics. However, I know that she can stitch over 1 thread as well as anyone. have to do it with a pen and ink. compared to 10 years ago, and how that has changed your designs over time? make use of it for your company? our own kits and patterns, but there is also nothing more fun or energizing. the best friends of a lifetime attending the needlework markets. Theater to pick these up. worn out the disc and has to now stream it on Netflix. anything from the Beatles, Peter, Paul and Mary, Coldplay, David Francie. We have recently added a delightful album to our mix: Red Rock Rondo. refers to it as geezer pop and has been trying to delete them all. taste) on top of cottage cheese and mayo. Repeat this layer 3--4 times. Garish with eggs and leave in layers and stir just before serving. it is always a favorite at our Spring and Summer barbecues. named Peter and Christian who are also a lot like pets. I remember being taught how to crochet by my Grandma when I was about 8. (I still have that first chain I made and it has seen better days). Then I was taught how to embroider shortly after that by my Great Grandma. That is all I can remember her doing is embroidering something. I was crafty on and off through High School and then when I moved in with a very good girlfriend, a gal where she was working showed her how to cross stitch. So every night she came home I would watch her and see the progress, well before long I was sitting next to her and the next thing you know the needle was in my hand. I’m very proud to say Debbie is the reason for me to have FanciMats & More to this day. And she is more than a huge help to me…she may not stitch much but she sure has wonderful idea’s and is always helping me do something in the shop. I’m working on year 5 (it was a pre-owned shop) and that will be a huge accomplishment come February 1, 2013……It has definitely been a journey and a very interesting chapter in my life. I look back and think of all I’ve learned and how many wonderful customers, vendors and designers have come into my life. I’ve also dealt with many life changing events that I never would have imagined 5 years ago. I’m a firm believer everything happens for a reason! Blackbird Designs, Little House Needleworks, Lizzie Kate, With Thy Needle, Shepherds Bush…..It is hard to pick as they are all so creative and wonderful and very unique in their own ways!!! What types of events do you offer at your store? Stitch Day is the first Thursday of every month from 1 – 4. Stitch Nights are the 2nd and last Wednesday of every month from 4 – 8. All stitch times are wonderful and growing with the number of ladies who come in to stitch. A pot luck has also been started on the 2nd Wednesday of every month….lots of great food! I try and host a few different Sunday Retreats within the shop, which I always try to have a theme. I generally provide Breakfast, Lunch, a snack and drinks and then 2 projects. And it lasts all day long!! My themes have ranged from Halloween, Valentine, French but my favorite so far has been the Royal Wedding Retreat…I’m a Royal Freak….so when they announce there is going to be a baby…Yep….I’m going to have a Baby Shower Retreat….Stay tuned for that as I have some ideas that will be fun but rewarding for low income expecting mom’s. Royal Wedding Retret...My Aunt Connie, Beefeater, Mom and Me at the Royal Retreat. And yes he stood like this for an hour. He was GREAT!!! And the attendees LOVED him!! 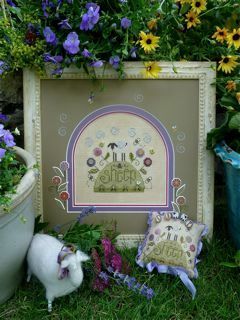 I have had just a few Stitching Day’s as well…..I’ll provide food and no projects!! These have gone over really well as a lot of ladies want to work on Un-finished projects. I hosted a Stitching Night about a week before Halloween last year and it was fun. I ordered pizza, had drinks and pumpkin bars and we stitched late into the night. This will definitely be an annual event. 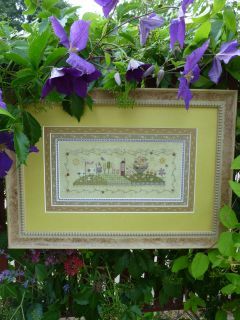 I have offered box, easel and Russian Punch Needle classes in the past. And I do feel really bad as I need to schedule time for these before year end. Where does time go? Is there an event or promotion that you offer that you feel is incredibly successful that you’d like to share? I just had my first contest, Santa Contest. I gave customer’s 6 months to get their favorite Santa stitched (or they could enter a piece already stitched). My 2 biggest rules were it had to be a finished piece and I had to be able to obtain the pattern in order to sell it. You know how it works, when someone sees something finished they want it! I was figuring I would have maybe 12 Santa’s, wrong!! I had 30 Santa’s and it turned out more than wonderful. I even had Santa Claus and Mrs. Claus in the shop on a Saturday and of course I had homemade cookies sat out every day. It went over so well I’m planning on another contest in January…Hearts!! And then in July 2013 it will be a Snowman Contest. First place was $100.00, 2nd place $50.00 and 3rd place $25.00 ---Gift Certificates to the shop! Besides stitching and running your own business, what are a few things you enjoy in your free time? I love to be in the kitchen!! Cooking is another passion and actually I’m a better baker than anything. I have a great collection of cookbooks…..very similar to cross stitching….I get them out and go through them ‘often’. And Yes I do use them! I spend a lot of time with Family and Friends as they are very important to me. Whether it is just dinner, a bar-b-que, breakfast out on a Sunday morning or maybe just cocktails!! It is all good and very enjoyable. I also try my best to just relax, running a business can take a toll on you! And when relaxing of course I enjoy my stitching…my hands seem to be busy all of the time! As my Great Grandma would say ‘Idle hands are the work of the devil’. Love the Pioneer Woman...Yes I stood in line for 4 hours to get signed cookbooks and a picture. I’m a Holiday Girl!!! But if I had to pick one it would be Thanksgiving! It is not only the food, the parade in the early morning and then football all day but the reason for the day!! It is to be Thankful and there is always so much to be Thankful for!! It also kicks off the most wonderful time of the year!!! -Would you share a favorite recipe? My Aunt Judy made this years ago…It was so good then and is still SO good and so sinful!!! Easy to make and everyone loves it!! I’ve had it in the shop often and it is a very big hit! Beat the above ingredients until smooth. Chill Ball and then roll in chopped pecans. -Who has influenced you most in your personal life? This is hard to just pick one person!!! For everyone that knows me they will probably know I pick Mom as number one!! She is the person who has made me the woman I am today. Plus she helps me more than she will ever know, not only in my personal life but in the shop. I look up to her A LOT and of course I want to be just like her…..And in reality I am. We joke we are sisters and not Mother and Daughter. 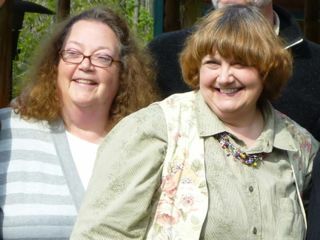 My Aunt Connie would be number two….She is a rock to me and a very good sounding board when I need it. She is always so positive and sees the good in everything!! And then I would have to say my Great Grandma!! I had her in my life until I was 18 and she is still in my heart very much so. I live in her house which makes me feel so good!! But I think of her often and wish she could see what I’m doing now and I would LOVE to know what she would think. And from a business stand point I would have to say a boss I had in the corporate world…..he taught me a lot about business and still does to this day. If I ever needed any help with the business I know I could count on him. He is not only a mentor to me but a life time friend I will have and appreciate him very much so. Mom and I at a VERY good friends Wedding! I managed a reconciliation department for a Title Insurance Company for 11 years. At one point I was responsible for 102 bank accounts and an average daily balance of 2.2 million dollars. It took a lot of time and hours but I was able to get all accounts on a daily reconciliation….so today we would balance yesterday’s activity. This was to know exactly where the accounts stood at all times and to mitigate fraud. And then I was able to get the daily work into a paperless environment. Very big achievement for me!! So looking back now and owning a business I just tell myself I can do this and I can make it work and be successful. My second achievement then would be being a Woman Business Owner. It is not always what it is cracked up to be but I’m still standing after almost 5 years so I think, no I know I can make it…and make it work for me!!! Hey Cindy! Great article!!! And I'm proud to say that my mom, my sister, and I have been coming to your shop for the past 5 yrs! It's great and we love to look at all the fun things you always have. Keep Stitching!